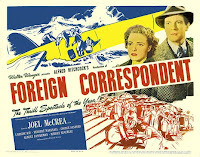 If I had to choose just one Hitchcock film to take with me to a desert island, my pick would be FOREIGN CORRESPONDENT. (NOTORIOUS runs a close second.) It's got everything: one of my very favorite leading men, spectacular Hitchcockian set pieces, romance, wit, gorgeous black and white cinematography, a great supporting cast, and George Sanders as a good guy. What more could a movie fan want? The leading man is Joel McCrea, playing John Jones, aka Huntley Haverstock, a newly minted American foreign correspondent tasked with finding out what's really going on in Europe and whether war is about to start. Jones is immediately thrust into unraveling an international spy ring responsible for kidnapping a prominent politician. When I think of this film what I remember, rather than the actual plot, are the amazing suspense sequences, coming one after the other: the black umbrellas bobbing in the rain as an assassin escapes...the wrong-way windmill against the desolate grey sky, a scene even creepier to me than the crop dusting sequence in NORTH BY NORTHWEST...Jones's life-and-death escape over a hotel sign...the anxiety-provoking sequence in the church tower...and a stunningly staged plane crash at sea. Truly edge-of-your-seat film viewing. Two hours fly past, building to the radio broadcast during the London Blitz when Jones tells Americans "This is a big story, and you're part of it" and implores Americans to "Keep the lights on." Fade out to the U.S. National Anthem. It's not only a great climax to the movie, it's a fascinating slice of history, as an example of how films were used to rally Americans to the support of the British before our actual entry into the war. And is there anything better than George Sanders as one of the good guys? He's one of the great film villains, but I really love it when his dry wit and wicked slyness are on the side of truth, justice, and the American way. Terrific fun...especially his own life-and-death escape from a hotel room, carried off with great panache. Add in another wonderful actor, Herbert Marshall, plus Laraine Day, Robert Benchley, Edmund Gwenn, and Harry Davenport...absolutely tops. Benchley, in fact, cowrote the film's dialogue along with novelist James Hilton (LOST HORIZON). Again, great stuff. One of my favorite lines: "If you knew how much I loved you, you'd faint." Charles Bennett and Joan Harrison wrote the original screenplay. 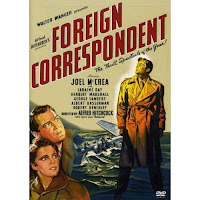 FOREIGN CORRESPONDENT was nominated for six Academy Awards, including Best Picture, Screenplay, Black and White Cinematography, Supporting Actor (Albert Basserman), Art Direction, and Special Effects. The movie unfortunately went home without a single Oscar...but that's what happens when the competition consists of films like REBECCA, THE GRAPES OF WRATH, THE LETTER, THE PHILADELPHIA STORY, and more. As a matter of fact, FOREIGN CORRESPONDENT lost Best Picture to Hitchcock's own REBECCA. Hitchcock, nominated as Best Director for REBECCA rather than FOREIGN CORRESPONDENT, went home without an Oscar, losing to John Ford for THE GRAPES OF WRATH. An amazing group of films which have stood the test of time for decades. This is one of a couple films Laraine Day made about the impact of war on Europe which helped stir a sympathetic reaction in the U.S. early in the war. The other film was JOURNEY FOR MARGARET (1942), a moving story about orphans of the London Blitz which deserves to be better remembered today. The black and white cinematography was by Rudolph Mate, who also photographed LOVE AFFAIR (1939), THAT HAMILTON WOMAN (1941), IT STARTED WITH EVE (1941), THE PRIDE OF THE YANKEES (1942), and GILDA (1946). It's rather something to think that the same man photographed such iconic film moments as Gary Cooper giving Lou Gehrig's farewell speech and Rita Hayworth singing "Put the Blame on Mame" in her slinky black gown. And I'm not sure Vivien Leigh ever looked more gorgeous than she did in THAT HAMILTON WOMAN. Mate also worked as a director; his credits include D.O.A. (1950), MIRACLE IN THE RAIN (1956), and one of my childhood favorites, SALLY AND SAINT ANNE (1952). 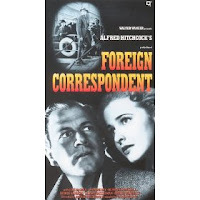 FOREIGN CORRESPONDENT has been released on a very nice DVD. It includes a substantive feaurette on the movie. You can also get the DVD as part of the Alfred Hitchcock Signature Collection. FOREIGN CORRESPONDENT has also had a VHS release. This film can also be seen on Turner Classic Movies, where it has been shown as one of "The Essentials." The trailer can be seen here. FOREIGN CORRESPONDENT is most highly recommended. As you go on to note, the answer to the question at the end of your first paragraph is: Robert Benchley - and it's got him too. This is easily my favourite American Hitchcock film, and the only one, really, with the lightness and semi-ironic style of the British masterpieces of the thirties. It amazes me that it is not routinely cited as one of his half-dozen greatest. I agree with both of you. It's a gem. The light touch and yet still all kinds of intrigue. I wish there were a contemporary equivalent! It's great to hear from others who value this film as highly as I do. It seems as though it's perenially overlooked on "best" lists compared to Hitchcock's later U.S. work. I've only just started to delve into Hitchcock's British films, but I agree, it "felt" very much like THE 39 STEPS, for example. Despite all the scary sequences, it has that light feel which I find appealing. Hitchcock always used humor, of course, but this film simply has a breezier tone I really like. The featurette points out one way this was accomplished, aside from the performances and dialogue -- Alfred Newman's score is often quite jaunty in tone, rather than dark and foreboding.